It hit hard and fast. I still have it and I have no idea how long it will last. I kind of hope it lasts forever. I woke up yesterday morning, comfortable in my own bed and thought how much I missed my pillow while I was in Rwanda. I grabbed a quick shower then struggled to find just the right shirt to wear before running an errand. I used the toilet before I left the house, flushed, washed my hands then used the Starbucks app on my iPhone to place my latte order. As I got into my SUV parked in the attached garage, I wondered what we would have for supper and whether I should stop by the grocery store and pick something up. The comparison of the excess in which we live in contrast to the poverty I left in Rwanda is stark. Absolutely every move I made was based on privilege. My warm bed, clean sheets, running water, indoor plumbing, closet full of clothes, vehicle, cell phone and even the ability to have a choice of what to eat for dinner is a result of what I have – what we have as a family – and I don’t think we’re all that different from many of our peers. Compared to the families I visited in Rwanda, our lives here in Canada are extravagant and excessive. The Canadian Foodgrains Bank invited me to participate in a media tour of Rwanda to look at where money raised by supporters of the non-government organization goes and how Canadian farmers doing their part to help end world hunger. For many Rwandan families, there is no opportunity to wonder what’s for supper tonight. The question is more likely to be whether there will be supper at all. For the large part, Rwandans are subsistence farmers – they farm in order to survive. There is frequently no extra food leftover to sell for profit; few jobs to help make ends meet. When we asked one farmer what the family does during the dry season when there are no crops, she said they usually go from eating two meals a day to one meal a day. 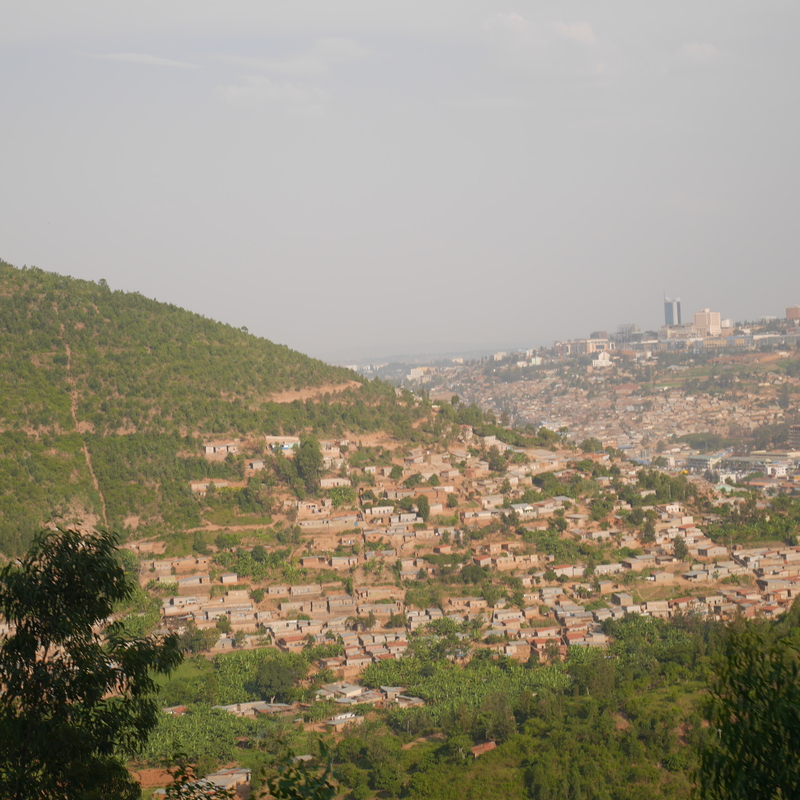 Rwanda is a densely populated country. In the east, there are fewer people as it’s the region hardest hit by drought and changing weather patterns due to climate change. In the west, however, where the rainforests feed into rivers at the foot of volcanic mountain range, the land is more lush, and therefore, has a higher population. Overall, 11.6 million people call Rwanda home, compared to 35.7 million in Canada. Size, though, is the difference. Rwanda is a third of the size of New Brunswick. While Canada has a population density of approximately 3.8 people per square kilometre, in Rwanda, that same amount of land has a density of 445 people. Farmers commonly work on as little as a quarter of a hectare – about .6 of an acre – to feed a family of six. Maybe both the mother and father have jobs – or maybe not. Rwandans wear the one or two outfits they own. They have no running water or, if they do, must boil it before consumption. In the countryside, their toilets are pits and in areas where there’s assistance from aid groups, hopefully a bucket of water and some kind of soap for hand washing outside the latrine. They haul water, some from a distance of up to five kilometres, tend the crops on their small plots of land, pray for rain, try to manage through scorching temperatures every day and hope there’s enough food to feed their children. Despite this marginal existence, the people of Rwanda met us with smiles and handshakes. The farmers we visited openly showed us their plots of land and proudly told us about the work they’re doing to feed their families. They talked to us about how their children, previously plagued with gastrointestinal problems or eye infections, are healthier because of the food they eat. The farmers took us into their kitchen gardens where they grow cabbage and onions and nutrient-dense foods like carrots and spinach – and talked about collecting rain water during the rainy season in order to keep their gardens growing during the dry season. Rwandan farmers happily shared a taste of their crop. In one community, the farmers donated corn for a simple meal, which we ate while seated on basic wooden benches in the living room of one of the farmer’s homes. The leftover corn was shared with others in the community. There was no waste. To be fed food by people who don’t have enough food to always feed their children was a stunning experience. 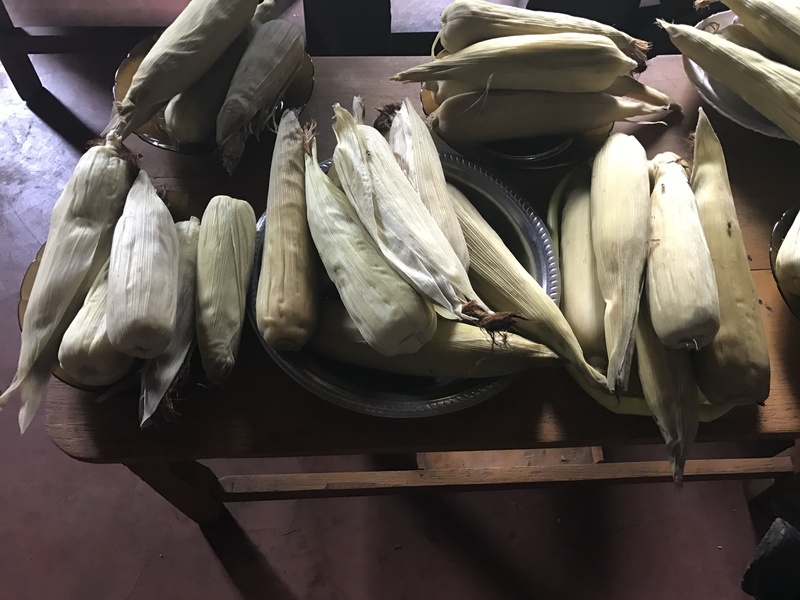 The desperation that built within me over the week in Rwanda and that bubbled up inside of me yesterday morning is lessened when I recall the giving spirit and kind smiles with which that corn was served. While the poverty was so clearly evident throughout my visit to Rwanda, the farmers we met aren’t letting it overshadow their existence. They are resilient. It is what it is. They get up again tomorrow and work hard. The contrast to our reality in Canada, though, is alarming. I now look around my home at every single item and wonder now how necessary it is in my life. I’m deliberately avoiding grocery shopping so I can use what’s in the fridge and freezer. I’m uncertain where this reverse culture shock will lead me, but at the very least, I hope it will bring about some personal reflection as I share some of the stories of the Rwandan people I met. Having a taste of corn, grown by farmers who struggle to grow enough food to feed their families, was an amazing experience.